OK, we admit it. We just can’t seem to get enough zombie stuff. Strategic Operations, Inc., familiar to many Marines and sailors as the San Diego studio-turned-tactical trainers who use Hollywood magic to create Hyper-Realistic combat training, is crafting scenes for a training conference in San Diego next month. Organized by The HALO Corp., a private security firm, the HALO Counter-Terrorism Summit will offer several realistic scenarios to more than 1,000 attendees as the company takes over the 44-acre Paradise Point Resort in the playground of Mission Bay and turns it into movie sets for the Oct. 29-Nov. 2 event. Among STOPs’ scenarios in the works: A downed pilot trapped in an enemy village (sounds like “Blackhawk Down,” but with a team of former SEALs playing the role of the good guys), gun-toting drug smugglers taking over a medical assistance village and a possible bio-chem attack. And then the zombies take over. In that “Zombie Apocalypse” scenario, held perhaps appropriately on Halloween, a VIP finds himself trapped with his security detail in village surrounded by zombies, according to a HALO press release. Using Strategic Operations’ innovative “battlefield effects,” something like a brain-eating virus has spread across the population in a much-feared pandemic, turning humans into zombies. But these aren’t your average big-screen walking dead. A zombie-driven truck, equipped with a vehicle-borne improvised explosive device, races toward them as they try to escape, and the bomb goes off. The zombies fight back with small-arms fire and rocket-propelled grenades. Amid all that chaos, and masses of crazed zombies hungry for a bite, the wounded VIP and his team have to fight their way out. We won’t know yet how this all plays out. But the VIP team will realize that killing zombies, much like we’ve learned from Hollywood, isn’t easy. A double tap might be needed. Or more. And they will have to do it without getting bitten or mauled by the zombies. Because we all know what becomes of you when that happens. Preparation is key. 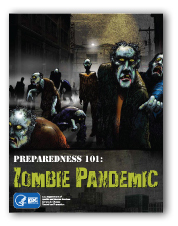 Even the federal government envisions a “Zombie Apocalypse,” in terms of preparing for the worst-case scenario. Like zombies. Read about that here. On the more serious note, former CIA and NSA director, retired Air Force Gen. Michael Hayden, is among several keynote speakers at the summit expected to include attendees from the military, intelligence, law enforcement and security communities.